Cordoba is a city of historical monuments, charming courtyards and winding streets. As the capital of a Roman province and the most populous city of the medieval world, the city sits on a rich cultural and historical heritage which will fascinate and charm its visitors. Although the area has been settled since the Neanderthals, it was the Romans who brought Cordoba into power. Due to its strategic position along the Guadalquivir River, the city became an important port and later the capital of the Baetica province. The Roman Bridge still spanning the river has been reconstructed several times over the centuries but still retains much of its antique style. You can also visit a Roman temple, a mausoleum and the Colonial Forum, or see the Roman walls surrounding Cordoba’s old town. After the invasion of the Moors, the city became the capital of the Caliphate of Cordoba with an estimated population of around 500.000. During this time, Cordoba was the largest and one of the most advanced cities in the world, as well as an important cultural and financial centre. The most impressive building in Cordoba, the Great Mosque, originates from this time. It was later rebuilt as a cathedral, and the mixture of Moorish and Christian styles makes it a fascinating sight. Other sights well worth seeing in Cordoba is the Alcázar, an old fortress and the seat of the Spanish Inquisition, and the nearby Royal Stables. Beside the Great Mosque you will also find the old Jewish Quarter with winding streets and beautifully decorated courtyards. 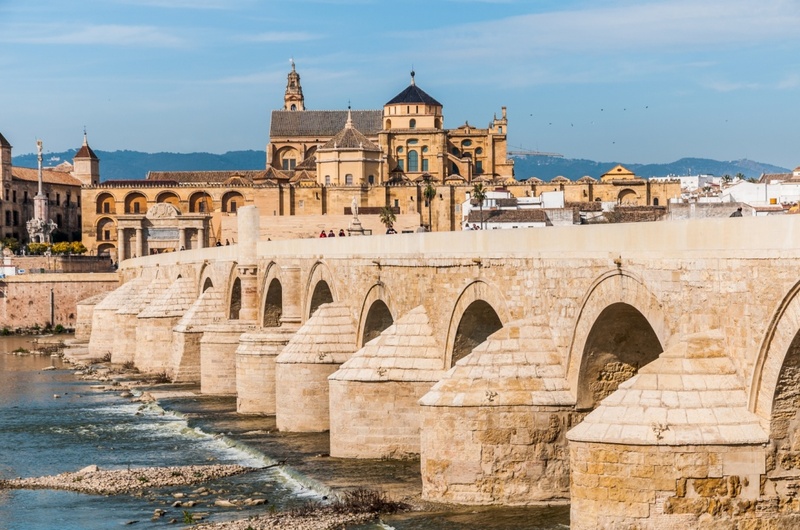 All of Cordoba’s old town is declared a World Heritage by UNESCO, the largest urban area ever listed, so take the chance to just walk around this magnificent city and enjoy its many great sights. Cordoba’s cuisine reflects its rich historical past, with influences both from the Moors and the rest of Andalusia. You will find plenty of excellent restaurants and tapas bars within the old town and around the Great Mosque. Local specialities are salmorejo, a thick and creamy soup, and flamenquín, a roll of ham and veal. The historical city also has a lot of options for bars and clubs. El Cardenal just in front of the Great Mosque has flamenco performances during the summer months, allowing you to round your day off with some Andalusian culture. Find information about selected Hotels, apartments and rooms in Cordoba to choose the perfect place for your accommodation.